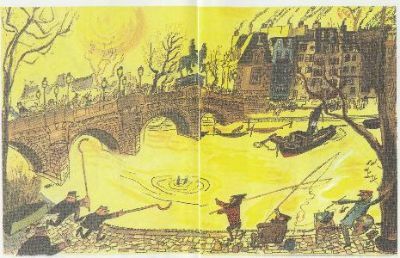 The Pont Neuf is the bridge that Madeline falls off of in "Madeline’s Rescue". The water she falls into is the Seine River. The men with the hooks who are coming to pull her out are Parisian police officers – they’re called "gendarmes". 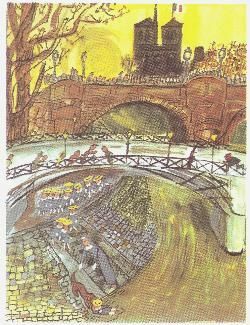 "Pont" is the French word for "bridge" and "neuf" means "new" – so the oldest bridge in Paris is called the "New Bridge"! The statue that is on the bridge is of Henri IV (Henry the Fourth) who was the king of France when the bridge was built. When the bridge first opened for use hundreds of years ago, it was a very busy place. Not only did many people use it to cross the river to the Ile-de-la-Cité, other people came especially to do business with all those who were crossing. There were people who set up stands to sell all kinds of things, like books or fabric for new clothes. There were places to buy things to eat or, if you had a toothache, to get a tooth pulled. There were singers, jugglers and other kinds of entertainers as well. Sometimes people liked to just come here to hang out and talk with their friends or watch all of the interesting people. It was a place that was like a combination of the mall and a big fair! The Pont Neuf is Paris’ oldest surviving bridge, dating from its inauguration by Henri IV in 1607. Construction on the bridge began in 1578, the purpose being to make it easier for the King to travel from his palace at the Louvre to the Saint-Germaine-de-Prés church. It was the first stone bridge built in Paris that did not have buildings built on it. Prior to this, bridges were treated like any other streets, and were lined on either side with residential/commercial buildings. The Seine, pronounced "Sen" is a major river of northern France, forming the country’s chief commercial waterway. The northern side of the river is described as the Right Bank (Rive Droite) and the southern side as the Left Bank (Rive Gauche) because when facing the same direction that the river flows, these are the directions to the right and left. The river is 780 km (485 miles) long, France’s second longest (after the Loire). It was the presence of the Seine that determined the settlement of the first men in the area which became Paris. The Seine, which belongs to an extensive network of rivers, is navigable all year. This allowed the new inhabitants to travel at will over a large area as well as putting Paris at the center of a watery crossroads that encouraged extensive commercial trade. 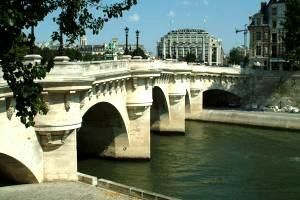 Location (Pont Neuf): From Rue de Pont Neuf on the Rive Droite in the 1ER arrondissement, across the Ile-de-la-Cité, becoming the Rue Dauphine on the Rive Gauche in the 6E arrondissement.